Hidden Veg Mac ' n' Cheese your new weeknight wonder. - Just Veg. 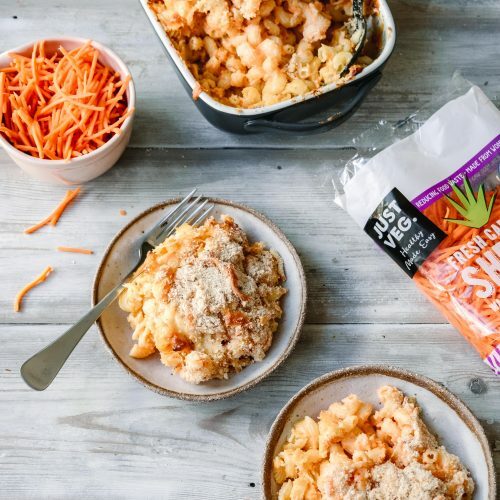 If you’re searching for fast and fabulous weeknight dinner inspo try our speedy hidden veg mac ’n’ cheese. It’s a simple family-friendly recipe, comfort food on steroids. Delicious, oozy, cheesy goodness with a hidden vegetable bonus. Shhhh! Don’t tell the kids there’s veggies in it. Throw in our handy Just Veg. carrot shred, cauliflower, pasta and cheese and you have tonight’s dinner done. Keep it in the fridge for a hearty afternoon snack or leftover lunch the next day. Healthy Made Easy with Just Veg. Using the wonky but tasty carrots to reduce food waste and help busy people stay healthy. Cut cauliflower into florets. Steam cauliflower and Just Veg Shred until tender. While the veg is steaming, bring a pot of water to boil and season with salt. Add pasta and cook as per packet instructions. Once vegetables are steamed, place into blender with stock and onion powder and blend until smooth. You can also use a stick blender in a jug. Place pasta, blended vegetables and 1 cup of cheese into a large bowl and mix. Spoon pasta mix into a baking dish and top with remaining cup of cheese and breadcrumbs, gently pressing down as you layer it up. Bake for 20-30 minutes until cheese is melted and breadcrumbs are golden. Serve right away and season as you prefer. Thanks to Naturally Nutritious for creating this healthy, easy and delicious recipe for us!